Grab your free cheat sheet below! New to Express.js and looking for a handy syntax reference? 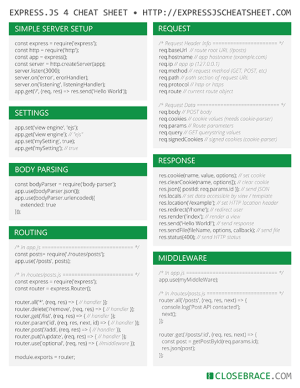 You can grab this beautifully-designed cheatsheet in high-res PDF form for free. It fits nicely on an 8.5"x11" piece of paper (or A4 for our European friends). Just enter your email address below and we'll send you the cheat sheet!